"How much should I be eating?" The dietary guidelines listed below will answer this question and help you know what and how much to eat. Eat a variety of foods every day. Eat foods low in fat, saturated fat and cholesterol. Limit daily fat intake to 25-35% of calories consumed and saturated fat intake to less than 10% of daily calories. Avoid trans fat as much as possible. Aim for the majority of fat intake to come from the "fats," which are monounsaturated and polyunsaturated fat. These fats are found in nuts, seeds, fish and vegetable oils. Limit daily cholesterol intake to less than 300 mg.
Eat moderate amounts of sugar. Read food labels and avoid foods with added sugar. Eat a limited amount of salt and sodium. Limit sodium intake to less than 2,300 mg a day. If you have high blood pressure, diabetes, chronic kidney disease, are African-American, or are 51 years and older, limit sodium intake to less than 1,500 mg a day. Season foods with garlic and fresh or dried herbs in place of salt. Keep the salt shaker off the table during meals to avoid adding salt. Water is used by every system in the body, so adequate water intake is important for good health. Total water intake includes water from all fluids, including drinking water, other beverages (coffee, tea, juice, etc. ), and foods with high water content, such as celery, tomatoes, broth soup and melons. The amount of water intake needed depends on the individual and their activity level, climate and health. Most people drink enough water by drinking when thirsty and with meals. Exercise portion control. 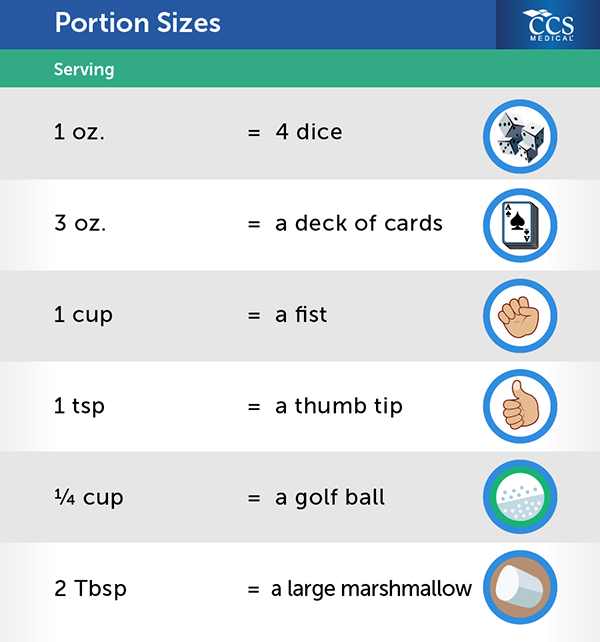 Use everyday items and your plate to calculate appropriate portion sizes. Carbohydrates are the body's main source of energy. The majority of carbohydrates eaten are in the form of starch or sugar, and nearly all carbohydrates turn into sugar or glucose when absorbed by the body. On average, 50% of calories eaten each day should come from carbohydrates. Commonly eaten sources of carbohydrates include bread, pasta, cereal, potatoes and fruit. 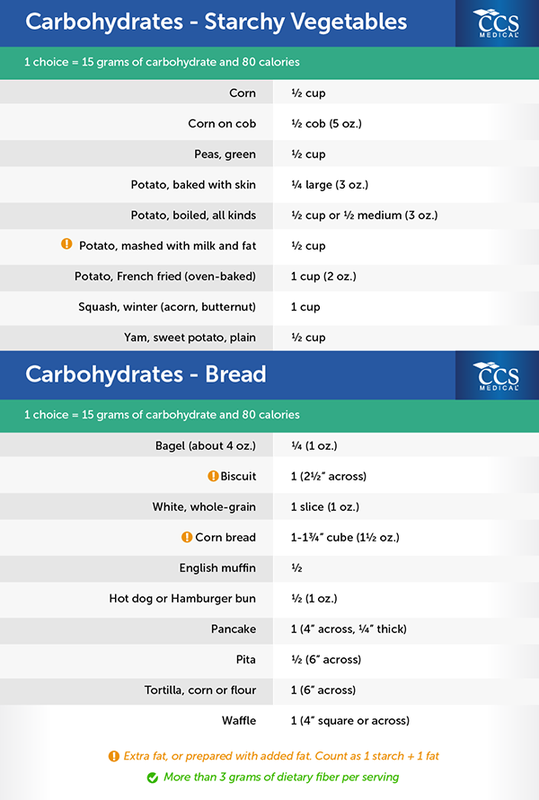 See the tables below for an expanded list of examples of carbohydrate sources, servings and calorie counts. Protein is broken down into amino acids, which are used to repair and replace body tissues. Protein is found primarily in meat, fish, poultry, eggs, cheese, milk, nuts and dried beans. The daily recommended protein consumption is 2-3 servings. Select lean meats, chicken (white meat, without skin), low-fat or fat-fat cheese, and beans as your main sources of protein. 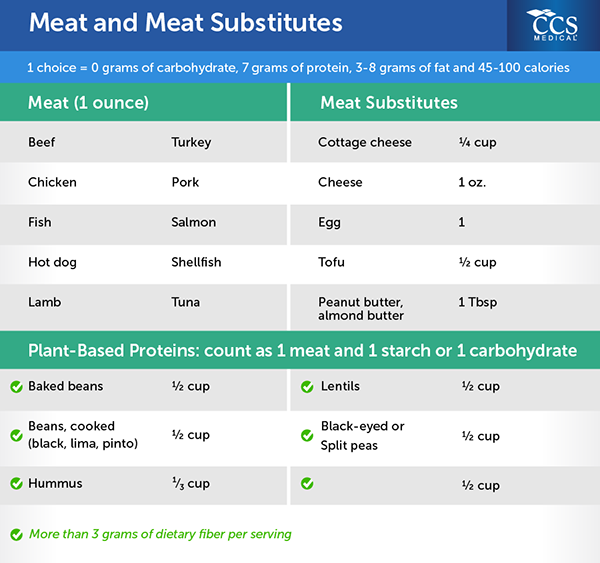 See the table below for a list of protein sources, serving sizes and calorie counts. A small amount of fat intake is necessary for good health. However, too much fat increases the risk of heart disease and can lead to weight gain and obesity. Recommended total daily fat intake is 25-35% of total calories. There are different types of fat. Some types of fat are healthier than others. Saturated fat is one of the unhealthy fats, because it raises the risk of heart disease and increases cholesterol levels. Saturated fat intake should not exceed 10% of daily calories; however, the recommendation is to aim for less than 7% of daily calories. Saturated fat is solid room temperature and is mostly found in animal products. Foods high in saturated fat include: high-fat red meats, bacon, sausage, butter, whole milk, cheese, and coconut and palm oil. Unsaturated fat is a healthier fat and may help lower cholesterol levels. Found in plant products, unsaturated fat is liquid at room temperature. 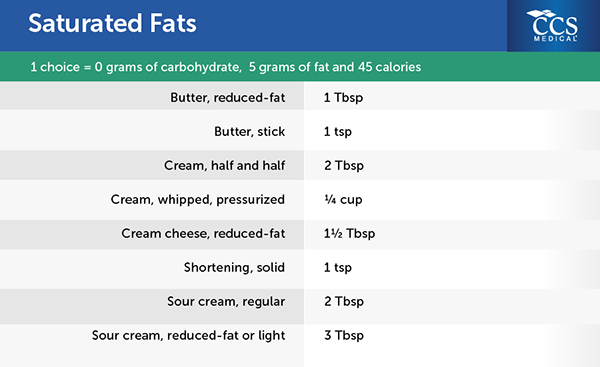 Most of daily fat calories should come from the two types of unsaturated fats: polyunsaturated fat and monounsaturated fat. Polyunsaturated Fat is a good fat commonly consumed through corn, safflower, soybean and sesame oils. Omega-3 fatty acid is a polyunsaturated fat found in soybean and canola oils, high-fat fish, flaxseed and walnuts. Monounsaturated fat is the healthiest fat to eat, because it may help increase "good" cholesterol levels. This type of fat is commonly consumed through canola, olive and peanut oils, avocados, nuts and fish. Trans fat is an unhealthy type of fat because it raises cholesterol levels (even more than saturated fat). Therefore, trans fat should be avoided as much as possible. Trans fat is made when hydrogen is added to vegetable oil. It is commonly found in commercially baked goods, stick margarines, and fried or processed food. 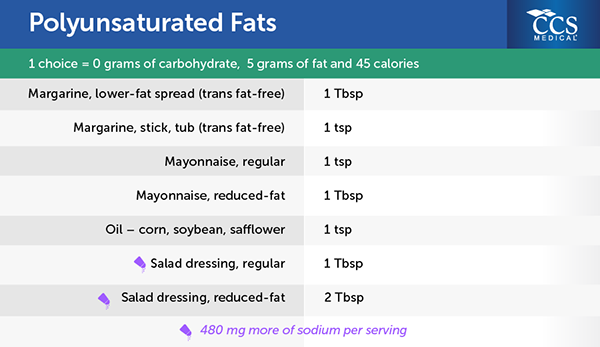 Based on daily calorie count, you can figure out how many total grams of saturated and unsaturated fat you should consume. Cholesterol is a chemical compound made up of fats and steroids. Most cholesterol is produced by the body; however, cholesterol is also ingested with some foods, such as meat, milk and cheese. Cholesterol intake should be less than 300 mg a day to help maintain healthy blood lipid levels. Low-Density Lipoproteins (LDL) is considered "bad" cholesterol because a high LDL level may increase risk for heart disease. The body makes LDL from saturated fats and trans fats eaten. High-Density Lipoproteins (HDL) is known as "good" cholesterol because it helps the body remove bad cholesterol. Triglycerides are the main form in which fat travels in the blood. While some triglycerides are needed for good health, high triglyceride levels can increase risk for heart disease. 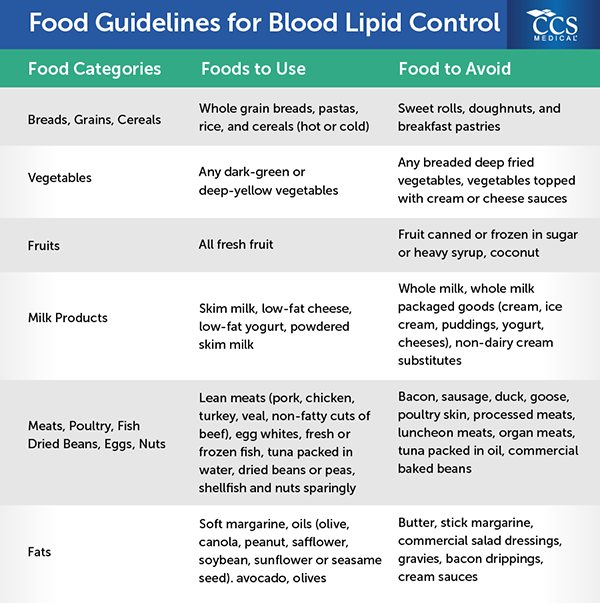 In order to maintain healthy blood lipid levels, follow these guidelines when choosing foods. 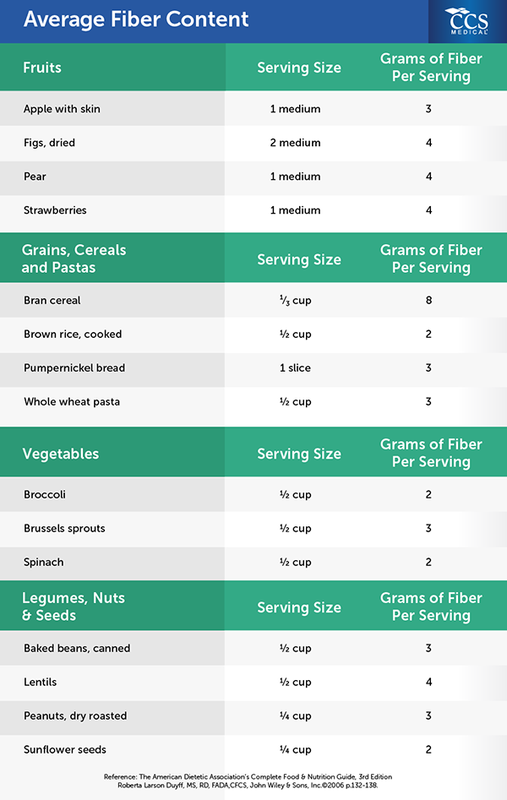 Fiber has many health benefits, yet many people do not eat the daily recommended amount of 20 - 35 grams a day. The body does not digest fiber; therefore, it does not add any calories. Fiber is found in plant foods, such as fruits, vegetables, whole grains, beans and legumes. Insoluble fiber does not dissolve in water, so it helps move food through the digestive system. This type of fiber prevents constipation, increases stool volume and helps waste pass easily through the intestines. Insoluble fiber is found in bran, whole grains, as well as some vegetables and nuts. Soluble fiber dissolves in water, which helps lower blood glucose and cholesterol levels. Soluble fiber is found in oats, beans, citrus fruits and barley. Increase fiber slowly - add no more than 5 grams a day. Adding it too quickly can cause diarrhea, gas and bloating. Drink plenty of water and non-calorie fluids. A high-fiber diet without enough fluid intake can cause constipation. Include a bean dish at least once a week; add beans to salads. Use whole grain cereals that have at least 4 grams of fiber per serving; combine with fresh fruit. Eat whole fruit rather than drinking juice. Snack on fruits, vegetables, popcorn or high-fiber crackers. Eat the skin on fruits and vegetables when possible. Increase vegetables portions at lunch and dinner. Look for packaged foods with at least 2 grams of fiber per 100 calories. Eat whole grain bread instead of white bread. Whole grain should be the first item listed on the food label. Avoid large amounts of processed grains. Vitamins and minerals are two important nutrients needed by the body for growth and a healthy immune system. Vitamins convert food into energy, and minerals help build strong bones and regulate heartbeats. 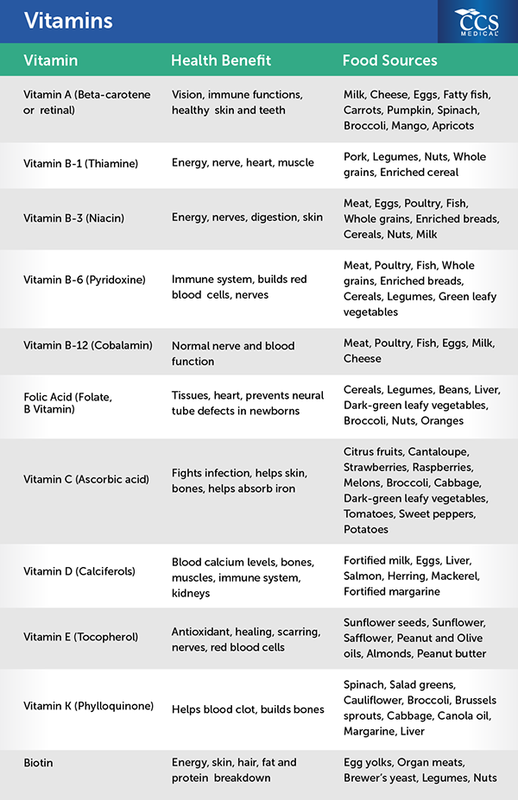 The body needs greater amounts of some vitamins and minerals than others. The best way to ensure you are getting enough of the vitamins and minerals your body needs is to eat a variety of foods. Aim to eat 3 servings of fruit, 5 servings of vegetables, and 2 to 3 servings of low-fat dairy products a day. Also try to eat beans, high-fiber breads and iron-enriched cereals. 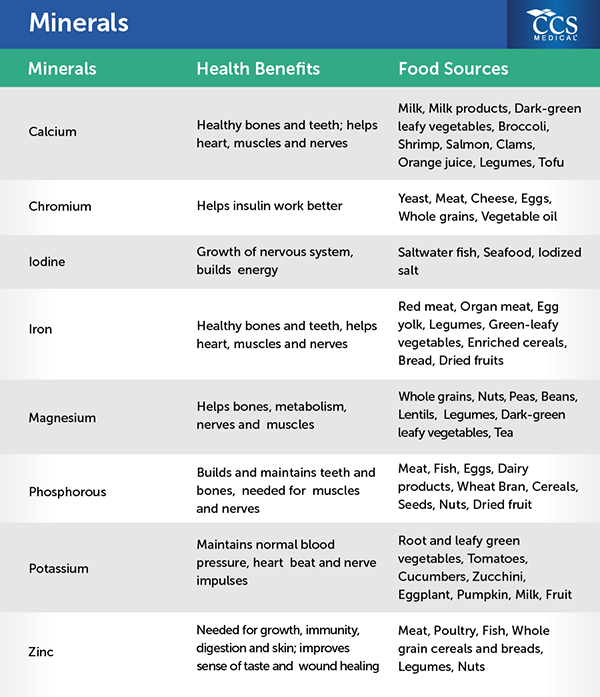 The charts below explain the benefits and food sources of each vitamin and mineral. Alcohol should always be consumed in moderation, which is a limit of 1 serving of alcohol a day for women and 2 servings a day for men. 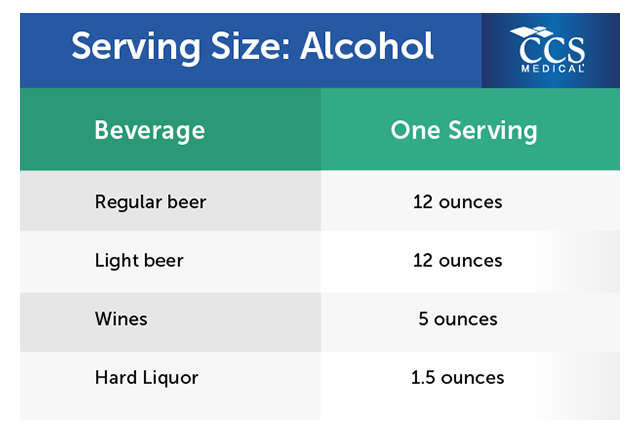 What Is a Serving of Alcohol? Those taking medications that may be dangerous when combined with alcohol - Ask your pharmacist or doctor before mixing medications with alcohol. Alcohol contains calories and can aid in weight gain. When choosing what to drink, select alcohols and mixers with fewer calories, such as those listed in the table below. There are two types of sugar substitutes - nutritive sweeteners and non-nutritive sweeteners. Nutritive Sweeteners Nutritive sweeteners contain calories and carbohydrates and can raise blood sugar levels. Sugar alcohols are some of the most common nutritive sweeteners. They are digested more slowly than regular sugar but still change to sugar and raise blood sugar levels. Sugar alcohols contain about half the calories and carbohydrates of sugar. Some common sugar alcohols are sorbitol, mannitol, maltitol and xylitol. These sugar alcohols are often used in "sugar-free" or "dietetic foods" such as chewing gum, candies and desserts. For some people eating even small amounts of foods with sugar alcohols can cause gas, cramps, bloating and/or diarrhea. In these cases, consumption of sugar alcohols should be avoided. Other commonly used nutritive sweeteners include honey, fructose (fruit sugar), carob, dextrose and corn syrup. These are "natural sweeteners," which can lead to the misunderstanding that they are healthy. In truth, they all contain calories and carbohydrates that can affect blood sugar levels. A few natural sweeteners do have the benefit of being sweeter than table sugar, so less is needed. Non-Nutritive Sweeteners Non-nutritive sweeteners are also known as "low-calorie sweeteners" or "artificial sweeteners." The most common ones are aspartame, sucralose, saccharin, acesulfame-K and stevia. These products are many times sweeter than sugar, so only a very small amount is needed. Because such a small amount is used, they do not provide calories or carbohydrates and do not affect blood sugar levels. "Sugar-free" does not mean carbohydrate-free. Read nutrition labels closely for carbohydrate counts. Simply cutting back on the amount of sugar in cooking and/or baking is an alternative to using sugar substitutes. Use nutmeg, vanilla, cinnamon or almond extract in place of sugar in recipes for a sweet flavor without added calories and carbohydrates. Products made with fat substitutes or "fat replacers" cut fat and calories, which can help with weight loss and lowering cholesterol levels. While fat-free, fat substitutes still contain carbohydrates and can affect blood sugar levels. Olestra is a common fat substitute. It is made from fat, but the body is unable to absorb it, so no calories are consumed. It does contain carbohydrates. Olestra may cause stomach and intestinal issues for some people. In these cases, consumption of fat substitutes should be limited. Reaching and maintaining a healthy weight can improve overall health and well-being. Weight loss can lower cholesterol and blood pressure, improve circulation, and strengthen the heart muscles. However, weight loss can be extremely difficult, because it requires significant changes in lifestyle, eating and exercise habits and routines. It also requires time for exercise and meal planning. The key to losing weight is to eat appropriate portion sizes and to burn calories through exercise. Set a realistic weight goal. A weight loss of ½-1 pound per week is realistic. Do not skip meals. This will help avoid overeating at the next meal. Eat regular meals and snacks. Eating 3 smaller meals and 3 small snacks can result in greater weight loss than just eating 2 larger meals. Keep a record of food eaten. This forces you to think about food choices and portions. Eat smaller portions. Try changing from a large plate to a smaller plate. Start a meal with low-calorie foods, such as vegetables, salad and fruit. Drink water before eating. This will make you feel fuller. Limit high-fat foods, foods cooked in fat, and fried foods. Select low-fat dairy products, such as low-fat cheese, milk and yogurt. Bake, broil or grill meat; do not fry it. Avoid using food as "comfort." Try to find a healthy alternative. Pay attention to what triggers you to eat and record it. Try to find healthier ways to cope with these triggers. Get moving! Aim for 30 minutes of exercise a day to start. Add 10 minutes a day every week; then add another 5 minutes. Find an activity you enjoy - walking with a friend, swimming, playing tennis, riding a bike in a park - and keep with it!